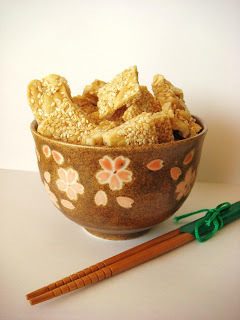 To start off my list of things to make for CNY, I give peanut sesame brittle a try! 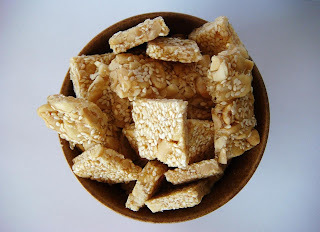 How hard is it to make peanut sesame brittle? Not hard.... right? 1. You don't end up with enough toffee. 3. You don't get it to the right temperature so it doesn't harden. 5. Your toffee hardens too quickly. Fortunately for me, only #1 and #5 occurred. With my first batch, I didn't mix the peanuts and sesame seeds together. I applied the toffee to the peanuts, then sprinkled with sesame seeds before applying the 2nd sheet of baking paper and rolling it out. With my shortage of toffee, I ended up with peanuts that wouldn't stick, along with sesame seeds also. So I added more sesame seeds to the leftovers and boiled myself some more toffee. So now I have two types of peanut and sesame brittle. Peanut>sesame brittle mini bars and sesame>peanut brittle squares. Mix peanuts and sesame in a large bowl. Bring water, sugar, lemon juice and corn syrup to a boil. Using a candy thermometer, stir and watch until the mixture reaches 150-155C. Quickly pour toffee into peanut mixture. And mix. Spoon onto a large piece of baking paper on top of a chopping board. Sprinkle with extra sesame seeds. Apply another large piece of baking paper over the top. Using a rolling pin, roll out to preferred thickness. Remove top sheet of baking paper. Slice into pieces whilst still warm. Allow to cool and it will harden. 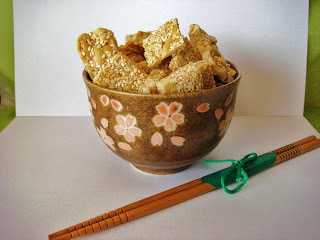 Never tried sesame in brittle. Sounds delicious!